In manufacturing , the Weld line or Knit line or Meld line is the line where two flow fronts meet when there is the inability of two or more flow fronts to "knit" together, or "weld", during the molding process. These lines occurs usually around holes or obstructions and cause locally weak areas in the molded part. A weld or meld line is a weakness or visible flaw created when two or more flow paths meet during the filling process. Weld lines can be caused by material flowing around holes or inserts in the part, multiple injection gates or variable wall thickness where hesitation or "race tracking" can occur. If the different flow fronts have cooled before meeting, they don't interfuse well and can cause a weakness in the molded part. A line, notch and/or color change can appear. What Caused Weld or Melt Line? A meld line occurs when two moving melt fronts converge and flow parallel to each other. Weld and meld lines are generally caused by holes or inserts in the part, multiple gates, variable wall thickness or hesitation and race track effects. 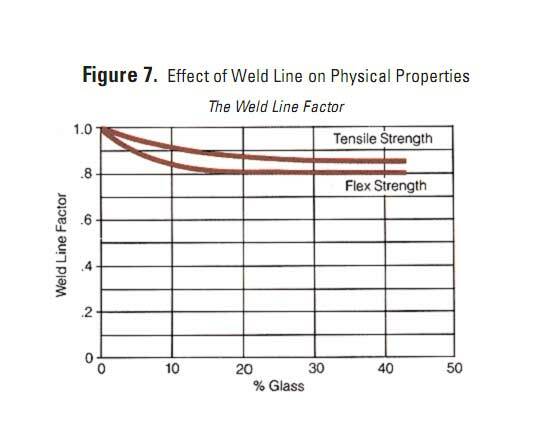 explanation from http://www.imtechdesign.com/ give brief reason why and when weld line, and melt line will occurs. a meeting angle, smaller than 135º produces a weld line; greater than 135º, a meld line. Note that the weld line surface mark disappears when the meeting angle reaches 120º to 150º. 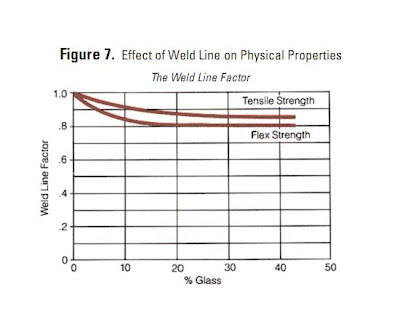 Normally, weld lines are considered to be of lower quality than meld lines, since relatively less molecular diffusion occurs across a weld line after it is formed. However, there is always an exception to the rule and some materials by nature tend to exhibit more visible weld lines irrespective of the angle. In addition many fillers and additives also highlight weld & meld lines. Glass fibres and metallic pigments are good examples. 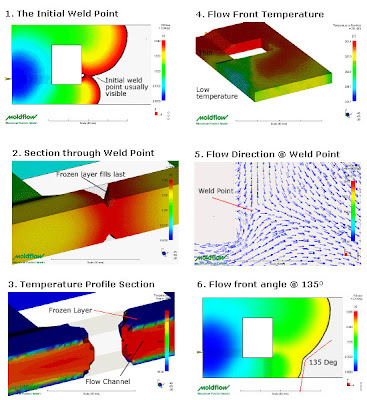 A study of the effect that weld lines and orientation have on physical properties of molded parts was undertaken to establish general guidelines for use in part design. 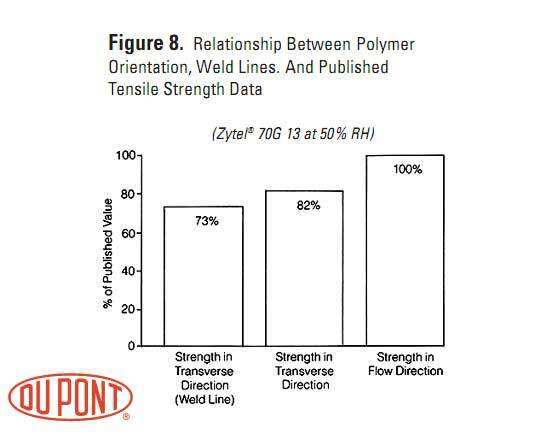 an experiment by dupont show that between polymer orientation, Weld Lines. 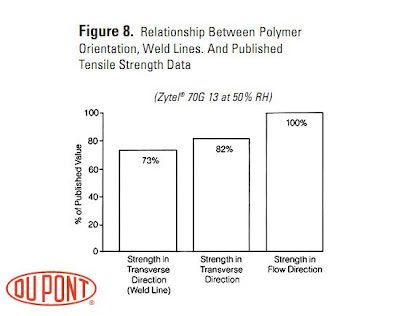 And tensile Strength have Relationship, see graph below. both to avoid weld lines in high stress areas and to take full advantage of glass fiber reinforcement. Techniques the designer might use to reduce stress level at a weld line include increasing the wall thickness or adding ribs. - This can be done by changing the polymer injection location or altering wall thicknesses to set up a different fill time. - increasing mold temperature, melt temperature, injection rate and pressure. - Change the gate positions. - Change the part thickness. - Instead, it often helps to increase the injection velocity, decrease the fill time, and increase the shear rate, which can lower the viscosity of the polymer during fill and thereby allow for better chain entanglement and better packing. Increasing pack or hold pressure also helps, as well as having longer pack and hold times. Increasing pack or hold pressure helps to eliminate low-pressure conditions at the weld line. Another tactic to promote more chain entangling at the weld line is to raise the mold temperature 10° C (20° F). Good job! You have a nice blog! I'm a plastic part designer, not a mold maker designer but this blog helps me to better understand the molds and to be able to improve my designs. Thanks for great info, I am having trouble with weld lines on a item that have shiny surface. I´m searching for suggestion and can share images of the result, Is there any way to get in touch to send some images and you maybe can give some suggestions? How to correct weld line in mold.. i can remove a steel..